Begin3°. The sides a and b of a rectangle are given. Find the area S = ab and the perimeter P = 2(a + b) of the rectangle. We shall use the IDLE Python as a programming environment, however the same results may be received in the PyCharm IDE that is also supported by Programming Taskbook. To create a template of the required task one should use PT4Load tool. The program imports all functions from the pt4 module and defines the solve function, which already contains the task function call that initializes the Begin3 task. The solution of the task should be entered in the solve function (of course any other functions may be used). To run the program press [F5] key ([Shift]+[F10] in PyCharm). 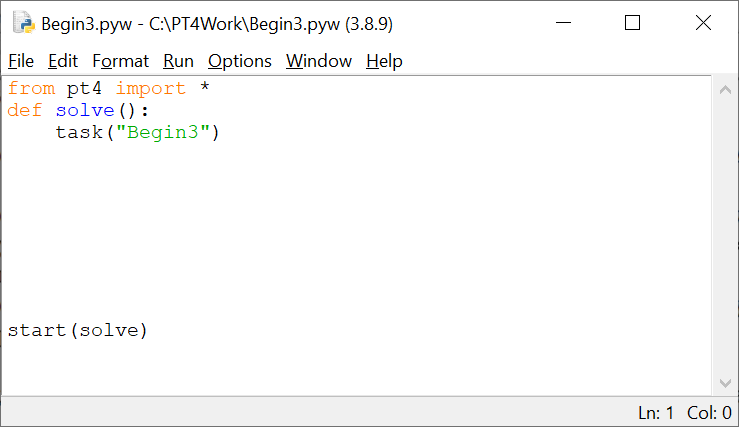 When the program is launched you will see two new windows: the Python Shell window and the Programming Taskbook window with a task text and initial data. For return to the IDLE code editor you should click on its window or press the [Alt]+[Tab] key combination. Before solving tasks you should input initial data in the program. In the Begin3 task the initial data are real numbers a and b that refer to sides of the rectangle. Run the program once again. You will see the new set of initial data. For each running of the program a new initial data are generated, so it is necessary to develop an algorithm that processes correctly all admissible sets of initial data. Data input is performed correctly, but the program does not output results. In such situation we have the following message: "Correct data input: all required data are input, no data are output" (Programming Taskbook version 4.15 or higher) or "Some data are not output" (previous versions). When the program is running you can see output values at the panel of results. Because we output data in inverse order, the status bar contains the error message "Wrong solution". This panel appears when the program processes successfully at least one set of input data. The progress bar shows the amount of tests which are already performed, the text above the bar allows to determine how much tests should be performed successfully. The program testing finishes in two cases: when all required tests are performed successfully or when some test is failed. In our case the algorithm is correct, therefore the message "The task is solved!" will be shown. Begin3      y23/02 20:13 Acquaintance with the task. Begin3      y04/02 15:07 Correct data input. Begin3      y04/02 15:09 Error NameError. Begin3      y04/02 15:12 Wrong solution. Begin3      y04/02 15:15 The task is solved! The letter "y" denotes the programming language being used (Python).